November. The month of Thanksgiving: the quintessential holiday to come together and share a meal with loved ones and remember all that you are grateful for. Beautiful and simple. While it may appear that things are crumbling around us, we still have so much to be thankful for. A few years ago, I started a daily gratitude practice. I would either consciously write everything I was grateful for at the end of the day- making sure to come up with at least 5, no matter how hard; or would lie in bed before sleeping at night and recall all of the things in my mind. Honestly, I am doing it more from bed these days, and many times I’ll wake up and realize that I fell asleep before acknowledging everything! Some days it can be so hard to come up with even five things- I would find myself grasping at straws, but then would remember simple things like my lights turned on or I ate 3 meals that day. As I continued this practice, it became easier and easier to find things to be grateful for and the more I felt grateful, the more things presented themselves to me- it really was and continues to be amazing! So, on this holiday when we consciously and collectively celebrate and give thanks for all of the things in our lives, I am inviting you to continue the practice daily (practice being the key word here!) You may just be amazed at how you feel! 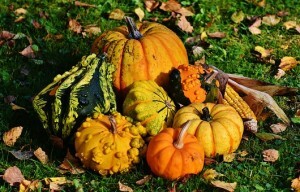 Wishing you a nourishing Thanksgiving and end of the year holiday season filled with joy, love, compassion, gratitude and connection. Our digestive system is made up of a hundred trillion bacteria. In fact, we are more bacteria than we are human! These bacteria essentially modulate our immune system and in order to keep our immune system strong, we need to keep our digestion strong. Producing anti viral and anti fungal substances. Unfortunately, due to environmental factors such as poor diet, environmental toxins, overuse of antibiotics or improper preparation of foods, many of us have created imbalances in our systems and suffer from maladies such as allergies, chemical sensitivities, chronic inflammation, yeast infections, autoimmune diseases. In order to regain our health, we must look to our guts. While taking probiotics can be helpful in re- establishing our beneficial gut bacteria, it is a good idea to rotate probiotics so that you are getting a wide range of different bacteria. An easy way to populate your gut with these organisms is to eat fermented foods. Fermented foods are created when the starch or carbohydrates in basic foods are broken down and changed by microorganisms into smaller, more digestible components. Lacto fermentation is an age old method of preserving foods. Each culture has it’s own signature fermented food. Some examples of fermented foods include sauerkraut, kimchi, pickles, yogurt, kefir, kvass. To preserve: The nutrients are preserved and you prevent the spoilage of perishable raw materials. To enhance flavor: Fermentation brings about unique and tangy flavors- think cheese, wine, sauerkraut. To salvage foods that would otherwise be wasted through an easy and inexpensive process. Easier Digestion: The presence of digestive enzymes break down and predigest the foods. Increased nutrient availability :Fermentation increases the bioavailability of beneficial nutrients- amino acids, minerals, vitamins B and C, and it has the ability to enhance the production of certain vitamins, particularly the B vitamins and Vitamin K2. Curb Sugar Cravings: Adding sour fermented foods to the diet can help curb those cravings for sugar. It is easy to add fermented foods to the diet. Start slowly, adding approximately 1 teaspoon to 1 tablespoon of ferments as a condiment with your meals. Use varieties of sauerkraut to top fried eggs, stir into grains, use in salads, sandwiches and wraps or add a bit to a bowl of soup. Eat small amounts of yogurt or drink small amounts of dairy kefir, water kefir or kombucha. As with all things, moderation is always key. These foods are medicine and we should not go with the mentality that “more is better”. Know that by adding small amounts of these foods into your diet, you are enhancing the beneficial bacteria in your gut. It is also important to eat prebiotic foods which act as food for the probiotics in our system. Prebiotics are basically indigestible fibers that keep your probiotic bacteria thriving. Some prebiotic foods include Jerusalem artichoke, dandelion greens, garlic, onion, asparagus and banana. By limiting processed foods and adding prebiotic and probiotic rich foods to your diet you will be on your way to better digestive health! Annmarie Cantrell, MEd is a wellness educator and chef specializing in connecting people with their intuitions so that they can fully nourish themselves and heal. She also has a small sauerkraut business and loves spreading the wonders of fermented foods. 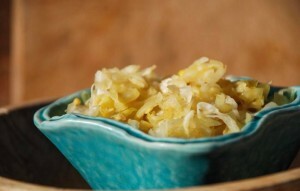 Traditional sauerkraut made the traditional way with just cabbage and salt and no heat processing? This method of preserving , known as lacto-fermentation provides enormous benefits! The process involves breaking down the cellulose of the vegetables (the salt helps to do that) so that beneficial bacteria can proliferate in the end product. The end product is teeming with beneficial probiotic bacteria, digestive enzymes and the vitamins present in the vegetables become more bio- available through the fermentation process. With the development of refrigeration and pasteurization, our culture has lost this traditional method of preserving, and yet it is so easy! Thankfully, it is making a comeback, as people are now understanding the importance of feeding our good bacteria for increased immunity. They produce enzymes that help us break down our food, they neutralize toxins in our system, the chelate (or carry out ) heavy metals, they are anti viral, anti biotic and anti fungal- really powerful, no?? Things that disrupt our gut bacteria include : processed foods, sugars, genetically engineered foods, stress, illness, antibiotic use. Having fermented foods as part of your daily regimen is one way to ensure the health of these bacteria! If you are not used to eating fermented foods, you will want to start slowly! And, honestly, they are meant to be eaten as condiments, not as side dishes! Try some today and see how you like them! You may also add other vegetables like carrot, daikon, radish, beet, or apple (although this would not be a traditional kraut). Either chop vegetables by hand or put through grater option of the food processor. The more finely the vegetables are chopped, the more surface area present for the bacteria to infiltrate. The vegetables will also ferment more quickly when chopped more thinly. Sprinkle salt over and begin to massage salt into the vegetables. You can either use your hand or a pounder to do this. As you pound, you are breaking up the cell wall and allowing the liquid to be released. This liquid will serve as your brine. Pack vegetables into a clean jar and push them down so that there are no air bubbles. Let vegetables sit on the counter (out of direct sunlight) for anywhere from 5 days to 3 weeks- taste it as time goes on and see how you like it!! When it suits your taste, transfer to the refrigerator. Yesterday I touched on using natural sweeteners in lieu of white sugar, high fructose corn syrup or artificial sweeteners. You may have noticed that I didn’t put agave on the list of natural sweeteners, and here is why. Agave is made from the agave tequiliana plant (the same plant that produces tequila). It is about 1 1/2 times sweeter than regular table sugar and is about 60 calories per tablespoon. It also ranks lower on the glycemic index- a representation of how a food affects blood sugar. According to Dr. Andrew Weil, it ranks lower on the glycemic index because it is high in fructose, which does not immediately raise blood sugar levels; the body has a more difficult time processing fructose than it does glucose. Additionally, agave is so highly processed so it is stripped of any nutritional value and it ends up having a higher fructose content than high fructose corn syrup! That makes it the sweetener with the highest concentration of fructose on the market! And, my pet peeve? It is used in almost EVERY “healthy” dessert, particularly vegan dessert items whose producers are against using honey. Don’t be fooled by agave. Don’t use agave, unless you are visiting Mexico and can get the sweetener directly out of the plant. This way, it is thick and viscous and retains it’s nutrients. Otherwise, what we have here in our markets is highly processed and harmful to our health. Stick with the other sweeteners I listed here yesterday. If you are enjoying the information in these blogs, please feel free to sign up here for my e- newsletter which comes directly to your inbox once every 2 weeks! Yesterday, I touched on the dangers of high fructose corn syrup. I don’t know how it is even allowed in our food system. Oh, right- corporations make money from it. Same with sugar, regular old beet or cane sugar- it’s in everything. And, those corporations know that sugary substances can hijack the brain’s biochemistry to keep us wanting more and more- so we keep buying more and more. Consuming sugar signals the release of dopamine in our system. Dopamine is the neurotransmitter that helps control the brain’s reward and pleasure centers. As we eat more and more sugary foods to get that pleasure feeling, dopamine begins to down regulate, meaning that we need more of the substance to get the same effect. Sounds like an addiction, doesn’t it? Well, sugar is considered to be as addictive as cocaine and heroine. But, it’s really devoid of any nutrition and sets our bodies up for issues like fatty liver disease, insulin resistance, diabetes, obesity and heart disease. We can begin to curb the amount of sugar we eat by simply reading labels. In processed foods, sugar is often at the top of the ingredient list (meaning that it is one of the more plentiful ingredients in that food). You can also check the amount of sugar in one serving of a packaged food and decide whether or not it is worth consuming. I tend to avoid sugar. My body doesn’t like it. My adrenals don’t like it. I immediately begin to feel tired, bloated and out of sorts. But, my body does better with more natural sweeteners; ones that have some nutritional benefits. Maple Syrup- Maple syrup is a delicious source of antioxidants, potassium, calcium and zinc. Grade B or the darker maples contain more of these nutrients. Maple syrup is delicious in cooked puddings, in baked goods or drizzled over pancakes or waffles. Black Strap Molasses- Molasses is made from raw cane sugar being boiled down into a thick syrup. Like olive oil, there are different levels of molasses. Black strap has the most nutrition and is extracted from the third boiling of the cane syrup, concentrating the nutrients and flavor. It is rich in potassium, vitamin B6 and iron. Use molasses in baking (quintessential ginger bread cookies) or stir it into tea or use a bit to give a more earthy flavor to baked goods. Be sure to buy ORGANIC, as non organic cane is sprayed with glyphosate. Coconut sugar- Made from coconuts, this sugar is lower in the glycemic index (meaning it doesn’t spike your blood sugar) and is also full or minerals. You can use it one for one in any recipe that calls for white sugar (although I always use less sugar than what a recipe calls for ; almost at least 1/2 of what a recipe calls for!) Note that this sugar is brown in color so if you are wanting to make a white icing with it, it will come out more beige! Raw honey- Really raw honey is rich in enzymes, antioxidants and antibacterial compounds. It is best when used raw, like stirred into tea or a hot cereal, but I do also cook with it. You want to make sure that the honey you are buying is raw. Raw honey will be thicker than the heated honeys you buy in those little squeezable bears. It may set up and be very thick and may even have some bee parts in it! Be sure that you are getting honey from a reputable source. Many of the supermarket honey is imported from China and is cut with high fructose corn syrup. Fruit purees- Fruits have their own incredible sweetness and can be used in baking in place of any of the above sweeteners. Pureed bananas, apples or dates are some fruits that I have used in baking. Remember that even with these natural sweeteners, it is all about moderation. If you crave sweet things, try eating more sweet foods like winter squashes and sweet potatoes, long braised cabbages or carrots. These foods are naturally sweet and can satisfy our cravings. Also, when eating foods with sweeteners, try to have a good fat along with it. The fat slows down the absorption of the sugar and lessens those blood sugar spikes. Think about adding a touch of raw cream atop a pudding that is made with maple syrup. Use good fats when baking, like butter or coconut oil and use eggs in baked goods to provide a bit of protein. Here is a recipe for a gluten free dairy free banana pancake. Serve it with some nut butter and a touch of maple syrup. Place banana, egg, almond butter, maple, coconut milk and vanilla in a large bowl and mix well using a hand mixer or food processor. Add flours, cinnamon, salt and baking soda. Mix well. Melt coconut oil on griddle. Add 1/4 cup batter and cook 3-4 minutes per side, taking care not to burn. Makes 4-5 pancakes. Make a double or triple batch to freeze. Who doesn’t like a little sweetness in their lives? We even crave it sometimes. But , how we get our sweetness from the foods we eat can make all the difference between health and illness. We have become a society addicted to sugar. The average American eats about 22 teaspoons of sugar PER DAY! That sounds outrageous, right? But consider how we use it. We put a couple of teaspoons in our morning tea or coffee. We sprinkle a little cinnamon sugar over our buttered bagel. Or, we eat a danish or a muffin for breakfast. We add a little to our hot oatmeal to sweeten it just a bit. Perhaps for lunch, we order an iced tea or a soda. We add ketchup to our hamburger and fries. We have dessert. We go home and drink some fruit juice. Later in the evening, we have some more sweetened coffee or tea with our dessert. It’s easy to do- sugar lurks in almost everything we eat- baked desserts, bread, in condiments like ketchup and Worcestershire’s sauce, even in jarred tomato sauces we put on our spaghetti. What are the issues with sugar? Well, first of all, much of the sugar on the market today is made from GMO beets, and , by now, I hope you understand the issues with these genetically engineered foods. Cane sugar, which is not GMO (yet) is one of those crops that is sprayed with glyphosate before harvesting. Today, however , I want to focus on high fructose corn syrup. High fructose corn syrup still exists in many prepared foods and the Corn Refiner’s Association has lobbied to change the name of high fructose corn syrup (which has rightfully gotten a bad rap) to “corn syrup” or “fructose syrup” . Don’t be fooled- it’s the same thing! You can find more on that here. Additionally, high fructose corn syrup has been tested to contain mercury and has been proven to be a contributor in leaky gut, fatty liver disease and increased cholesterol levels. If you want to make one change toward creating a healthier life, be wary of where high fructose corn syrup hides in your foods. Become empowered to remove it from your diet by eating less processed foods, avoiding sugary drinks like soda, avoiding nutrient devoid breakfast cereals. Many of our kitchens are equipped with them. They are convenient- heating and cooking things in a matter of minutes. But, is it really worth it to use the microwave? The way microwaves heat; by causing water molecules in the food to resonate at very high frequencies and eventually turn to steam, causes changes in the food’s chemical make up. Studies have shown that foods heated in a microwave oven have a reduction in vitamin content and vegetables often lose their potent antioxidant compounds. Another issue exists when heating foods in plastic container or papers. Studies have shown that carcinogens present in these products leach into the food when microwaved- compounds like BPA, benzene, toluene, PET (polyethylene terephthalate)- you get the idea! Additionally, microwaves emit dangerous radiation at levels higher than what was previously thought. So, in a nutshell, avoid microwaving. If you have one in your home, use it for extra storage! It is so easy to heat up food on the stovetop, in the oven, or in a toaster oven. Yes, you have more clean up to do, but your health matters; and having good health in today’s world is not convenient! Popcorn is the quintessential microwave food. You can make it on the stovetop just as easily, and believe me, it is worth it! Microwave popcorn is usually full of weird chemicals, additives, colorings- you don’t need it!! Be sure to get some organic pop corn for this! Any extra toppings like melted butter; and if you want to get fancy and have flavors, you can make savory popcorn by sprinkling curry powder, turmeric, cayenne.- Or make it sweet with some honey or maple and coconut oil! But, whatever you do, don’t forget the good quality salt! Return the pan to the heat. Shake the pan over the heat source, keeping the lid slightly ajar. Shake until you stop hearing the pop. Transfer to a bowl and season! Ditch the Creamer- go for the cream! We’ve been touching a bit on dairy and I hope you understand that dairy from animals on organic pasture can be a healthy addition to a diet. Raw whole milk, raw cheese, cream, butter are full of essential minerals and vitamins. I also hope that you’ve taken away that the “fat” in these products do NOT make us fat. There is NO reason to be drinking low fat or skim milks. Lately, I have noticed an obsession for the non dairy coffee creamers and I’m not sure if it’s because folks are trying to avoid cream or because they just like the flavor. You know the ones, the flavors of French Vanilla, Eggnog, Hazelnut, Vanilla Caramel, Creamy Chocolate. Delicious, right? Well, have you ever looked at the ingredients in those creamers? INGREDIENTS: WATER, SUGAR, PARTIALLY HYDROGENATED SOYBEAN AND/OR COTTONSEED OIL**, AND LESS THAN 2% OF MONO- AND DIGLYCERIDES, DIPOTASSIUM PHOSPHATE, SODIUM CASEINATE (A MILK DERIVATIVE)***, COLOR ADDED, NATURAL AND ARTIFICIAL FLAVORS, CARRAGEENAN, CELLULOSE GEL, CELLULOSE GUM, DISODIUM PHOSPHATE. Sugar- After water, it’s the first ingredient and if you know about reading labels, the ingredients are listed according to their prevalence in the food .. so basically, you’re consuming liquid sugar. Partially Hydrogenated Soybean oil- OK, even the FDA came clean on hydrogenation a couple of years ago and admitted that hydrogenated oils are dangerous to our health. These synthetic fats are proven to cause inflammation- and inflammation is at the root of many modern diseases (heart disease, autoimmune diseases, cancer). Additionally, soy and cotton are genetically engineered crops and studies have shown that the oils contain residue of glyphosate (the active ingredient in Round Up which is heavily sprayed on genetically engineered crops). Remember, glyphosate has been proven to cause endocrine disruption, digestive issues and interferes with the functioning of our beneficial gut bacteria. Carrageenan: This is a common additive in many foods (non dairy drinks like almond milk, ice creams and yogurts. It is added to give foods a thickness and a fuller taste. Carrageenan is derived from a seaweed, so it is considered “natural”. Studies have shown that carrageenan is particularly destructive to the digestive system, stimulating an immune response that is similar to the response when your body is invaded by pathogens. This immune response causes inflammation which can lead to ulcerations and bleeding. Natural Flavors- This is what makes the creamers taste so irresistible. However, natural flavors are often another name for MSG (monosodium glutamate). MSG is an excitotoxin, exciting your brain cells to the point of damage. Not to be a Debbie Downer here, but it is really important to know what we are putting into our bodies. If you can’t do dairy, reach for a bit of coconut milk (without carrageenan!) . Here’s a tasty alternative for those creamers. If you can do dairy, you can also add a touch of vanilla extract and a bit of cinnamon to your cream! Mix all ingredients and add desired amount to your coffee. Store the rest in a covered container in the refrigerator. Butter! I consider it a food of the gods! Luscious, creamy and nutrient dense. Unfortunately, many are still of the old, false mindset that butter is bad. That is why those companies who produce the buttery “spreads” are having such a run. Companies like Benecol, Smart Balance and Earth Balance are continuing to prey on consumer fears about cholesterol. These spreads come equipped with “plant sterols” that they advertise have the ability to lower one’s cholesterol in 1-2 weeks. Well, the ingredients in these spreads consist of plant sterols, vegetable oils, (like canola and soy) emulsifiers, soy lecithin, preservatives like potassium sorbate, citric acid, colorings and flavorings. And, the ingredients in butter? Cream and maybe some salt- that’s all ! And, we now know that butter from animals raised on organic pasture is loaded with fat soluble vitamins – A, D and K2- and it also contains iodine – which our thyroids need to function optimally. Butter also contains butyrate – a fatty acid that is protective against colon cancer, but also works to regulate our immune system. Our gut bacteria has the ability to make butyrate out of the fibers we consume, but if our guts are not functioning optimally, we may not be making sufficient butyrate. So, eat your butter! I love to put a BIG pat of raw butter on oatmeal, on gluten free sourdough bread, on steamed vegetables and this time of the year, on organic sweet corn! If you don’t have access to raw butter, be sure to buy organic butter that is from pastured cows. Let me know how you like to use your butter! Yesterday, we touched upon breakfast, probably the most important meal of the day. And, you want to be sure that your body is well fueled. What you drink is also as important as what you eat. This country has been on the low fat craze for a long time now and the result? As a nation, we are fatter, sicker and more malnourished than we were before. Well, first of all, fat satiates us. It provides us with a satisfied fullness so that we are not constantly hungry and reaching for some empty calorie sugar laden food. Secondly, fat is needed to make our cells function. About 50% of our cell membranes are composed of fat- and it’s SATURATED FAT! If we want to nourish our bodies, we can’t eschew the fat. And, lastly, fat is needed to absorb the ever important fat soluble vitamins – Vitamins A, D and K2. These three vitamins work synergistically to provide the body cell building blocks, immunity and strength. Without the proper fats in our diets, we can become deficient. So, why whole milk? And, please note, when I speak about milk, ideally your milk would be unpasteurized from a farmer that you trust. This milk is from cows who are raised on organic pasture and not fed grains. If you are unsure about raw milk and the benefits, please visit the Real Milk site to read up more about it and find out if it the right choice for you. Otherwise, if you cannot get raw milk and need to have milk, your next bet is ORGANIC PASTURED WHOLE MILK. This milk will be pasteurized and most likely homogenized (where the fat globules are broken into smaller segments so they stay suspended in the milk rather than rise to the top). There are some companies, however, who do not homogenize their milk but you most likely won’t find them in your supermarket aisle. Please DO NOT buy the ultra pasteurized milk. This is milk heated to Ultra high heat processing that completely destroys the milk proteins and valuable nutrients.The only benefit of UHT milk is for the dairy company- it kills everything and allows for a longer shelf life! Eww! Unfortunately, many organic milk companies have UHT milk- so please read the labels carefully! To bring some life back to your milk, try culturing it into kefir! OK- now to the fat! Like I said, the fat in the dairy is what allows you to absorb the vitamins present in the milk, as well as help you digest the milk sugar, or the lactose. The process of making low fat milk involves stripping whole milk of all of it’s fat, essentially leaving skim milk. The milk is then heat processed and this non fat dried milk is then added to liquid milk- making either 1 or 2% milk. Seems harmless? Well, actually, in the process of heating the milk, the cholesterol in the milk becomes oxidized. So, here is the distinction for you. Cholesterol is not bad. It is a vital substance that our body needs to help control inflammation. We typically shouldn’t be worried about dietary cholesterol from real, nutrient dense foods. We should, however, be very concerned about oxidized cholesterol. It is this substance that plays a role in heart disease! Are you shaking your head yet?! I know, here we were drinking the low fat milk because we were afraid of the fat and the cholesterol and we think we’re doing it to keep our weight manageable and prevent disease. Nope- we were actually spurring on disease and weight gain! 1. Strive for unpasteurized whole milk- this has the delectable cream on top- oh my! 2. If unpasteurized milk is not an option in your area and you must have some milk, opt for pastured (grassfed) organic WHOLE MILK that is NOT ultrapasteurized. 3. If numbers 1 and 2 aren’t options, skip the dairy and have a beer instead! (Just kidding)! Milk is rich in tryptophan, which the body converts to seratonin and helps with sleep. Add honey, cinnamon, turmeric and vanilla.